2 sisters Challenge Blog: ... ANYTHING GOES. Creative Inspirations: Challenge 152 - Anything Goes! Paper Playtime: Ch# 68 - Say It With Sentiments Challenge using PET Images! Beautiful card, Linda. Your coloring and design are wonderful. Such a great take on the sketch. Hi hi, den pilskade kan man da kun blive glad i låget af Linda :))Dejligt kort!! Cute turtle and fun card! Thanks for joining us at Scrapalicious. 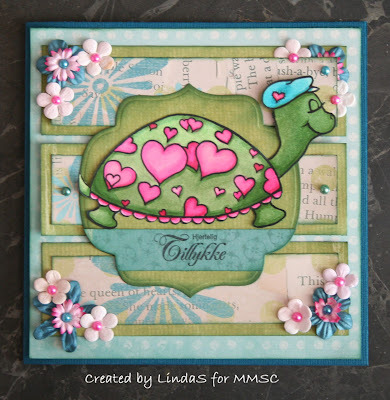 Linda, your sweet turtle is so pretty with all those lovely pink hearts. Beautiful coloring, background colors and pretty flowers. Beautifully done! Rigtig sødt og flot kort. Your turtle is just too cute! Love the pink spots! Linda, you know how to put a smile on a face! This little turtle is so sweet, and full of spring freshness and color. I love all you flowers, as well as your choice of colors!! Beautiful!